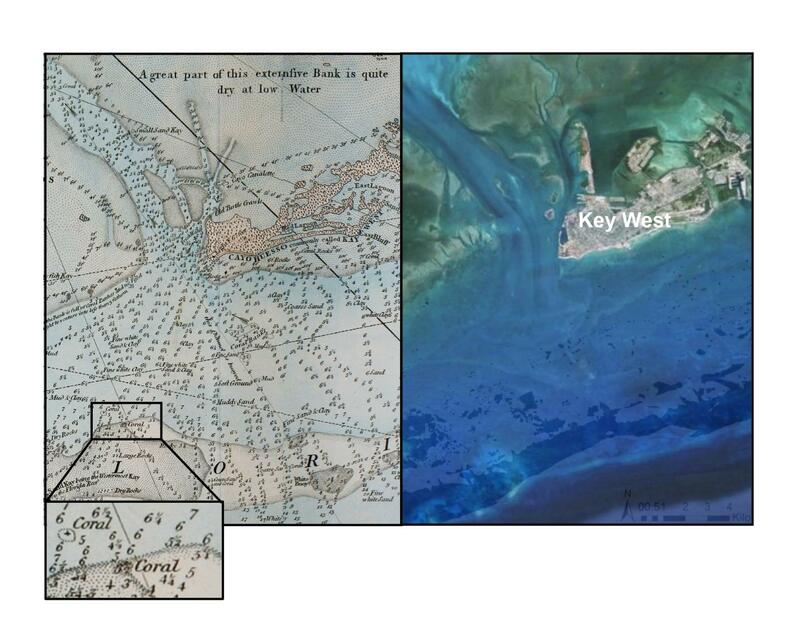 18th Century Nautical Charts Document Historic Loss of Coral Reefs: Researchers studying 18th century British nautical charts tracked the loss of coral reef habitat in the Florida Keys over the last two centuries. According to their analysis, entire sections of reef near the shore that were present prior to European settlement are now largely gone. Loss of coral can fundamentally change ecosystem structure and services including the productivity of coastal fisheries, water quality and storm protection. Establishing the extent of this historical coral reef suggests views of their current conservation status, based on more modern measurements, may be overly optimistic. To counter a lack of long-term information on coral reefs, Loren McClenachan and colleagues studied coral depicted on two historical charts spanning from Key Largo to the Marquesas Keys. They compared these coral ranges to modern images, finding an overall 52% loss of the area of seafloor occupied by corals. The extent of coral in Florida Bay and near shore declined by 87.5% and 68.8% respectively, while offshore areas of coral remained largely intact. McClenachan et al. also identified evidence of early drivers of change to nearshore reefs (like land development and water use changes at the start of the 20th century), which are different from the drivers of modern coral reef degradation, such as ocean acidification. The authors note studies of other species and ecosystems should likewise strive for longer time frames instead of assessing change only within species' known, modern ranges. Nautical charts produced for other heavily trafficked colonial regions – including Jamaica's Kingston Harbor and Hong Kong Harbor – could provide similar information on coral reef changes over centuries.